All photos by Christopher Testani. When the New York Times asked Melissa Clark to explore the world of electronic pressure cookers, she hadn’t cooked with one before. But the obsession with products like the Instant Pot had been growing and Clark knew it was just a matter of time before she would have to learn how to use them. She says Instant Pot users talked about the slow cooker as though it was a lover: “It was bordering on obsessive in this interesting way for me, aside from being a writer and a reporter. So, I bought an Instant Pot and started to play.” It was then that she came to understand the fervor surrounding the appliance. Clark is no novice when it comes to dessert, however. With the Good Food Pie Contest less than two weeks away, she shares her secrets for expertly flaky pie crust and for creating visibly stunning lattice decoration. Listen to the full interview above for all her tips. And be sure and try your hand at Melissa’s excellent coconut cheesecake recipe below, made with a pressure cooker. 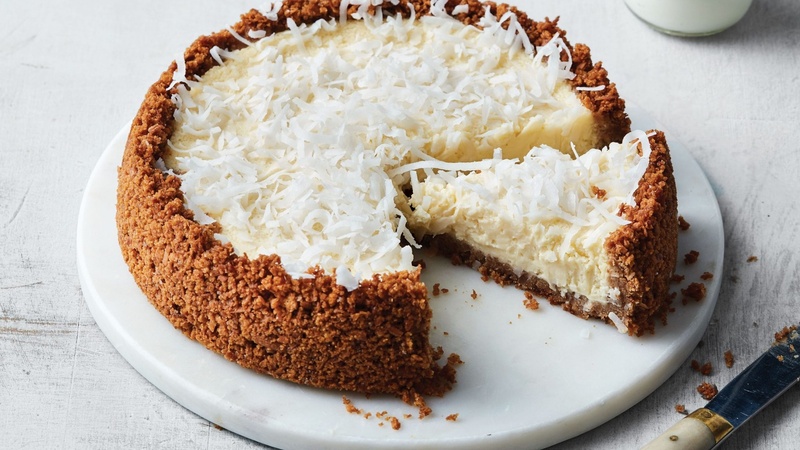 This velvety cheesecake is made with toasted coconut in the crust plus a shaggy garnish of shredded coconut on the top. As with the classic cheesecake recipe, make sure your cream cheese is very soft before beating it. If your kitchen is cold, consider microwaving the cream cheese (removed from its foil package) for a few seconds. Cold cream cheese is much harder to beat until smooth. Note: To toast the coconut, place it in a small skillet, set it over medium heat, and toast, stirring, until it turns golden brown, 2 to 3 minutes. Transfer the coconut to a plate to let it cool before using. Make the crust: combine the graham cracker crumbs, toasted coconut, coconut butter, coconut sugar, and salt in a small bowl. Pat the mixture into a 7-inch springform pan, patting it all over the bottom and ½ to 1 inch up the sides. Bake until the crust has set and is golden brown, 8 to 12 minutes. Transfer the pan to a rack to cool. Make the filling: Using an electric mixer fitted with the paddle attachment, beat the cream cheese and sugar until the mixture is very smooth (this could take several minutes if your cream cheese is not soft). Then add the coconut cream, beating again until incorporated. Add the rum and salt, and beat on medium speed until all the ingredients are incorporated and smooth. On medium-low speed, beat in the eggs, one at a time, scraping down the sides of the bowl between additions. Add filling to shell: Pour the filling into the prepared shell and cover the top of the springform pan with aluminum foil. Feel the pressure: Fill the pressure cooker with ½ inch of water. You can either place a steamer rack in the pot and then lower the cake pan onto the rack using a homemade sling or, if you have a rack with an attached handle, simply lower the rack and pan together. Cover and cook on high pressure for 32 minutes. Remove from pressure cooker: Let the pressure release naturally for 8 minutes, and then release the remaining pressure manually. Lift the pan out of the pressure cooker and transfer it to a wire rack. Remove the foil. Note that the center of the cheesecake will still be wobbly; it will set further as it cools. Top the warm cheesecake with the shredded coconut and let it cool completely. Chill out: Cover the cooled cake with plastic wrap and transfer it to the refrigerator to chill for at least 8 hours and preferably overnight to firm up. When you are ready to serve it, release the springform sides and place the cheesecake on a platter.